The La Paloma Campaign – Let’s Go! To make a donation for this campaign, click the button below. Click this image for more information about this campaign. During the 59th Annual Convention of the Episcopal Diocese of the Dominican Republic, the Rt. Rev. Julio C. Holguín announced that he planned to retire on November 1, 2017. With his leadership, the Diocese of the Dominican Republic has seen amazing growth in the number of Episcopal congregations, schools, scholarships, number of full-time priests and deacons, and mission teams who come from the United States to work in the Dominican Republic. The Dominican Development Group has launched the “La Paloma” fundraising campaign to honor Bishop Holguín’s 26 years of service and to enable the ministries of the Dominican diocese to continue to grow. With the visionary leadership of Bishop Holguin since 1991, the diocese has indeed been soaring. The number of congregations has grown from 22 to 70. The number of schools has increased from 7 to 28. Full scholar­ships to these Episcopal schools have increased from 0 to 298.The number of full-time clergy, including deacons, has grown from 15 to 43. This year over 50 mission teams will work in the diocese as compared to 2 that came in 1991. This dramatic growth has occurred at the same time as the Dominican diocesan budget has decreased its dependence on annual funding support from the General Convention of The Episcopal Church from 85.6% in 1991 to 9% in 2017. 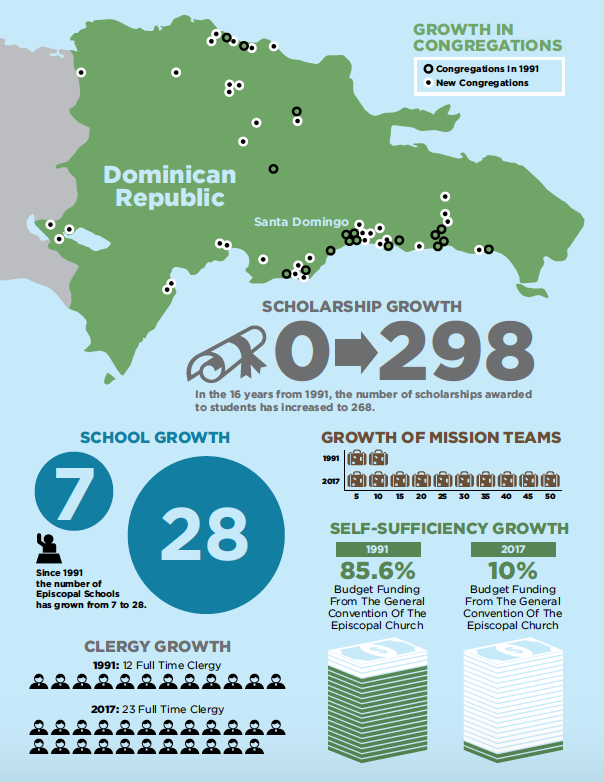 This movement toward financial self-sufficiency for the Dominican diocese has come about largely through the establishment of an endowment fund, the earnings from which funded 59% of the diocesan annual budget in 2016. In recognition of Bishop Holguín’s retirement on November 1, 2017, the Dominican Development Group has launched a campaign to raise additional funds to increase the value of this endowment to make possible the financial self-sufficiency of the diocese under its new leader, the Rt. Rev. Moisés Quezada. This idea of self-sufficiency is not a new one: Bishop Holguin has been building on the foundation of his predecessors to work toward that goal throughout his 26 years as the leader of the Episcopal Diocese of the Dominican Republic. In celebration of Bishop Holguin’s 26 years of ministry, the DDG is asking involved Dioceses, churches, mission teams and individuals to join this fundraising effort. Brochures, bulletin inserts, event ideas etc, will be made available in April to support local activities and raise awareness of the good works of our brothers and sisters in the DR. These resources will be continuously updated on our campaign website, https://givingsites.com/thedove. 1) Give by check. Make your check out to “Dominican Development Group” with “Capital Campaign” in the memo field. Send your check to: Dominican Development Group, PO Box 272261, Tampa FL 33688-2261. 2) Give through PayPal or credit card. Your instructions for the intended use of your donation should be placed within the “Add special instructions to the seller” area on PayPal. 3) Organize a fundraiser. You can organize a fundraiser or appeal through your church, diocese, or mission team. Use our resources for support. Email Leslie Pendleton at lpendleton@episcopalfoundation.org with questions. The Dominican Development Group (DDG), a non-profit organization within The Episcopal Church, was established in 1998 to assist the Episcopal Diocese of the Dominican Republic with project planning, program development, and construction expertise; to raise funds for the diocesan endowment; and to coordinate the work of mission teams from the United States working in the Dominican Republic.